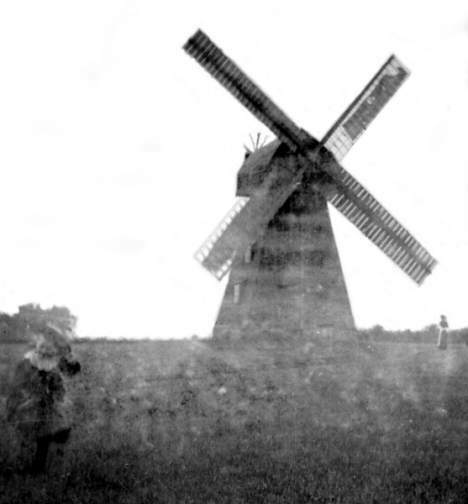 The Windmill - a history. Text and drawing © Dennis Claydon 1998-2012. Photographs © Joan D.Moore, Martin Clark. 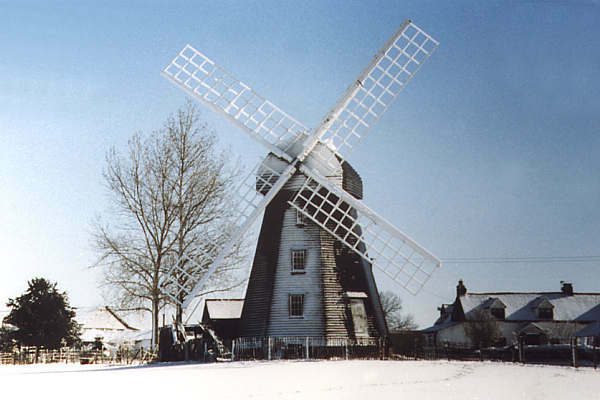 Known as a Smockmill because it is said to resemble an old man wearing a smock, the Lacey Green Windmill is the oldest of its type in the country. Originally built in 1650 at Chesham, it was reputedly moved to its present site, by order of the Duke of Buckingham, in 1821. It is said there was a lack of wind to power the Mill in the Chesham valley, hence the move to the ridge top at Lacey Green. Another theory for the removal is that there became a preponderance of water mills in Chesham. 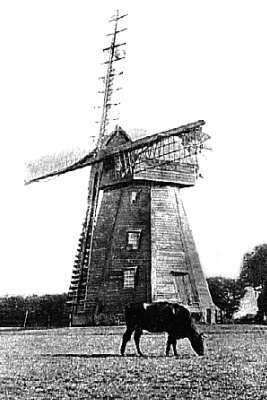 Wind power not being so reliable as water power, the Windmill was made redundant. The Will of Peter Tyler of Loosley Row, dated March 1808, suggests there was an earlier Windmill on this site. Tyler makes provision for '....my share of the Windmill at Loosley Row' to pass to his second son, Joseph. In 1821 when the present Mill was re-erected on this site, the village of Lacey Green did not extend as far northwards as it does today. 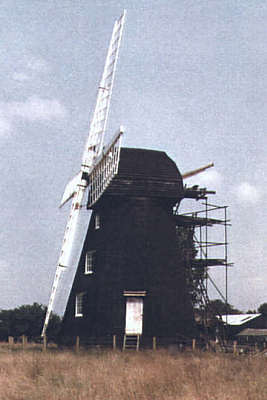 The Mill was, therefore, then referred to as Loosley Row Windmill. Thus, both Loosley Row and Chesham can stake a claim to this historic and interesting landmark. The Mill is ideally positioned, for it catches the full force of the westerly wind, all the way from Swindon in Wiltshire, over eighty miles away. The numbered timbers in the tower indicate the Mill was dismantled for removal and reassembled. The cap was originally turned to the wind by hand, using an endless chain. Later a fantail was added, which greatly aided the work of the miller. The mechanism has indications of rather greater antiquity than is usual in a Smockmill. Both the brake wheel and the great spur wheel are of a type which must have been becoming obsolete in the seventeenth century. The brake wheel is large, nearly three metres in diameter and this, together with the great spur wheel, are made entirely of wood. The spokes are of oak, the rims of elm and the cogs and teeth of beech. This octagonal Smockmill was last in operation around 1914/15. 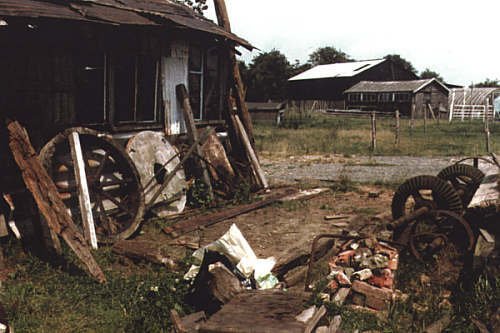 Once it ceased work it became derelict and fell into decay. Attempts were made to repair it when it was used for a short time as a weekend cottage. During the Second World War it served as a lookout post for the local Home Guard. By the 1960's it seemed in imminent danger of collapse and disappearing altogether. During 1967/68 a technical survey was carried out to ascertain if a complete restoration was possible. Mr Christopher Wallis conducted the survey. He considered the project feasible and masterminded the whole operation through to fruition. 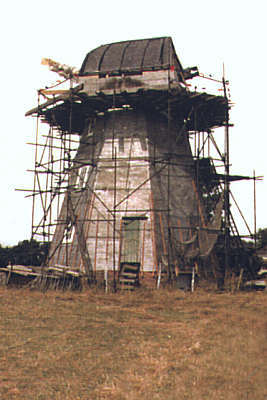 An agreement was reached with the owners in 1971 to lease the Windmill to the Chiltern Society, initially, for a period of twenty five years. Over the following twelve years a programme of restoration was undertaken by the Chiltern Society. The Mill was finally "opened" by the late Lord Bernard Miles on the 23rd April 1983. The sails wait to be fitted. After more than six decades of inactivity, new life has been breathed into the building, for, once again, flour has been ground. 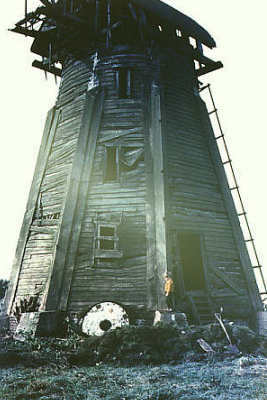 Occasionally, on suitable days, the Mill is "in sail". It is open to the public on Sunday afternoons and Bank Holiday Mondays from the beginning of May until the end of September, 2.30 to 5.30pm. ready to fit the tail fan. and Mr Martin Clark for the use of their photographs. > The Windmill played a starring role in Sheaf to Loaf Day in August 1998.
www.laceygreenwindmill.org.uk Lacey Green Windmill's new official home page. With full visitor information, its history and restoration. Photos of Buckinghamshire and Beyond includes other mills. The Chiltern Society's Home Page. Society for the Preservation of Old Mills has links to mill sites world wide. 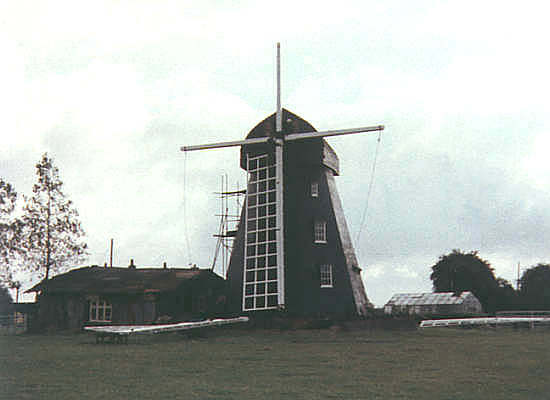 Dutch windmill pictures and a page of links to other mill sites.